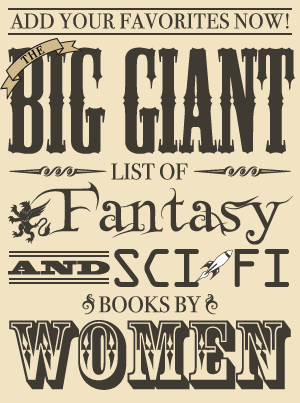 Throughout April I set aside my normal reviews and coverage of book news on Fantasy Cafe to turn over the mic to some of the many women doing wonderful work in the speculative fiction genres. I am quite happy if they want to talk about issues related to being a female author or fan, but my goal is simply to gather a bunch of women invested in the genre in one place at one time and showcase the work they are doing. Contributions have ranged from women discussing their own work and process to what they find best about the works of other women to issues of representation and equity in fandom. In the last two years, over 100 women have been either featured as guests or mentioned as inspirations to the guests who have written posts (with links to many more). Although it's possible to find plenty of lists now, for me there's always a certain thrill in asking people what their favorite books are. Perhaps because I grew up unable to do it or maybe it's because if something sounds awesome I can go get it immediately. Building recommendation lists like this feels like a way my adult self is carving out a space for the baby genre fan that she could have been had she only had the resources; it's a statement and a reclamation. Maybe the list will be for that baby genre fan in our lives who wants to know which way to go and isn't sure; for the curious friend who wants to learn more; or as a resource to let us know what genre fiction by women is celebrated and loved at this moment in time.